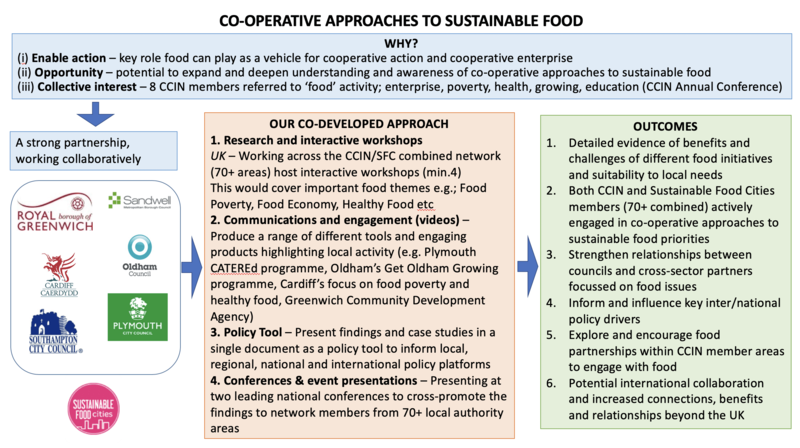 Led by Oldham Council this project will show how Co-operative Councils can address their food poverty and healthy eating objectives (building on the Sustainable Food Cities principles) through local partnerships with sustainable local businesses (often, but not always, co-operatives or other social enterprises). It will show how such initiatives can contribute to local job creation, the local food economy and improved health outcomes. The proposal involves a series of workshops, research opportunities, learning and exchange visits, case studies and producing a final report/video that is to be presented at both the CCIN Annual Conference and the Sustainable Food Cities Annual Conference in 2019. 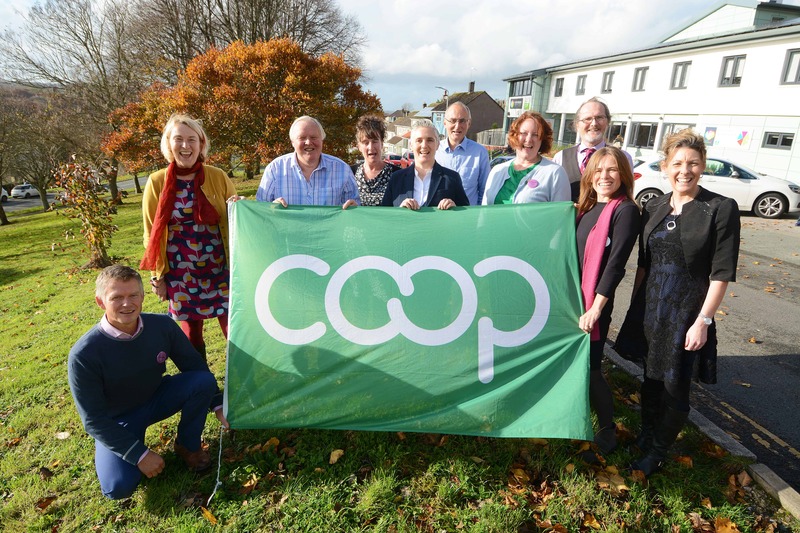 Led by Plymouth City Council this Policy Lab is an enquiry into strategic Council participation in support of doubling the size of the co-operative economy before the end of the next parliament. We will develop a detailed case study and toolkit based on the experience of developing a strategic action plan and delivery programmes to double the size of the local co-operative economy in Plymouth – this will include a summary of national/international context and key questions to ask at each stage of the development of local thinking and solutions. increased economic value in terms of more effective service delivery and improved outcomes for local residents as a consequence of meaningful neighbourhood working. the benefits of increased democratic engagement of local residents at a local level, as citizens become more involved in co-producing outcomes in local communities. Lead by Plymouth City Council this Policy Lab seeks to promote the Cities of Service model for social action across the Network. Cities of Service is effectively about people helping people. Cities of Service takes the strategic overview and leadership role of local government and combines it with the skills, knowledge, and energy of citizens to address the most pressing challenges in a given geographical area. The model is based on four defining characteristics – leadership, clear objectives, purposeful action, and impact. It has helped to elevate the significance and status of volunteering in both Plymouth and Bristol and has prompted us to think about the role of social action in designing services and in complementing and enhancing core public service provision. Over 10,000 people so far have shown us that they want to make a difference in the place where they live by getting involved in Cities of Service projects and we want to scale this work up even further to work with even more citizens across the network to tackle the key issues in each local authority area. For both Plymouth and Bristol, we are addressing our most difficult challenges by working with our greatest asset – our citizens. This project is being sponsored by Peopletoo, Associate Members of the Network. Peopletoo wishes to support the increased awareness and understanding of social value and maximising social outcomes across local government. Social value should be mainstreamed in local government. The public sector pound can generate substantial social value without increased cost and in many cases can deliver lower costs and improved service sustainability whilst contributing positively to local communities. Although there are pockets of best practice across local government, it is inconsistent and requires increased awareness and a systematic approach across organisations to ensure that social value is one of the core outcomes measured and evaluated. Employment, Assets, Support Vulnerable Groups, Local Communities, Local Businesses, Sustainable Services, Environmental Impact, Regeneration & Economic Development. To get this project off the ground we need a lead Council to come forward and get involved.